The fuel card market witnessed impressive growth at a CAGR of 5.8% during 2013-2017. The transaction value of fuel card was worth US$ 1 trillion in 2017, with growing adoption in business and truck fleet creating sustained opportunities. Driven by growing need for implementing an efficient fuel management system, the transaction value of fuel card systems is likely to reach nearly US$ 1.1 trillion by 2019. The fuel card market is projected to witness healthy growth at a CAGR of 6.8% between 2018 and 2028. On the back of increasing awareness about environmental impact of harmful emissions and imposition of strict environmental rules, Europe is likely to remain the leading market for fuel cards during the forecast period. Increasing vehicle fleet and ongoing industrial developments in China and South Korea are likely to create lucrative opportunities in East Asia. Note: For more extensive insights into the global fuel card market, request a sample. What are the Key Growth Drivers of Fuel Card Market? Corporate payment landscape in developed regions of North America and Europe, have been undergoing fast-paced digitization, which is expected to augur well for the fuel card industry. Increasing need for efficient fleet management in large organizations, as a part of companies’ fuel management processes, have triggered sales of fuel cards around the world. The global transportation and logistics industry has gained pace with growing urbanization and industrialization. Thereby, leading industry players are adopting fuel cards to implement more efficient fuel management systems. 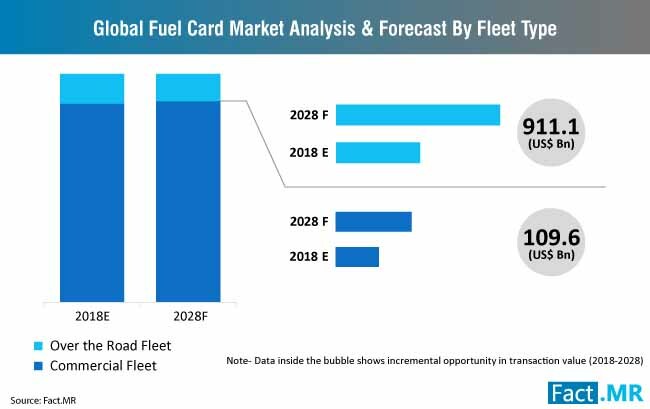 Rapidly-growing trucking industry across the world, especially in North America, will remain instrumental in shaping the fuel card market during the forecast period. With an incessant rise in harmful emissions due to the transportation sector, emission control rules are becoming more stringent. This is triggering sustainability measures in both public and private sector. 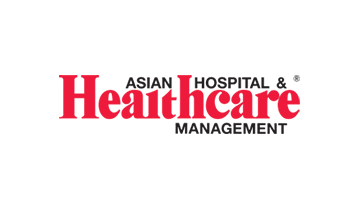 The persistent search for an efficient system to control fuel expenses and incorporate transparent fuel management systems among corporate organizations continues to gain traction. Leading players in the fuel card market are focusing on facilitating secure payments, while maintaining ease of transactions. Note: To gain detailed information on growth drivers of global fuel card market, request a sample. What are the Key Challenges in the Fuel Card Market? The increasing trend of electrification of the automotive industry is likely to become prominent in the upcoming years, limiting the sales of conventionally-fueled vehicles. 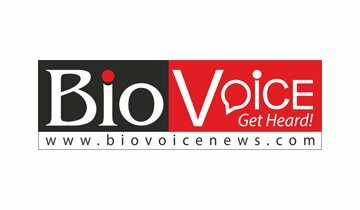 Adapting to the new status-quo will a significant upgrade in terms of new technologies and workforce. Security and cyber threats breaches continue to gain massive mainstream coverage, which is a key influencing factor for buyer behavior. 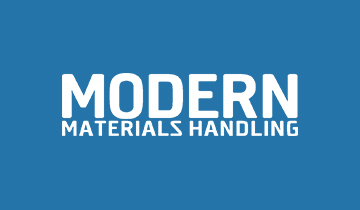 In April 2019, Radius Payment Solutions – a U.K.-based payment and fleet services company – announced it has acquired Plant-i – a leading provider of telematics and detailed risk management solutions for the construction sector. With this acquisition, Radius Payment Solutions will add Plant-i’s 25,000 assets to its portfolio to become one of the largest telematics company with over 120,000 devices. In March 2019, FleetCor Technologies, Inc. – a leading provider of fuel cards and workforce payment services – announced that it has entered a definitive agreement with Nvoicepay, Inc. – a developer of accounts payable (AP) software for domestic and international b2b payments. With this acquisition, the company aims to expand its Corporate Payments portfolio by incorporating Nvoicepay’s automated AP solutions, which could help FleetCor to manage full disbursement of accounts payables, including both domestic and international payables, for businesses. In March 2019, WEX Inc. – a U.S.-based provider of payment solutions – announced that it will acquire the fuel card business of EG Group – a European fuel station and convenience retailer. The company aims to broaden its fuel card acceptance in attractive European markets through the independent fuel card network developed by EG Group’s fuel card business. 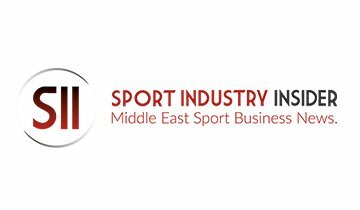 With this acquisition, the company also aims to reduce its sensitivity to retail fuel prices while strengthening its position in Europe. In November 2018, Edenred – a leading French stakeholder in the fuel card market – announced that it has entered an agreement to acquire Corporate Spending Innovations (CSI) – a U.S.-based developer and provider of automated corporate payment software. 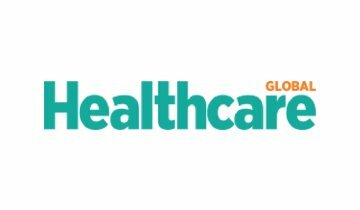 The company announced that this acquisition is in line with the company’s Fast Forward strategy to strengthen its position in the buoyant corporate payment industry. 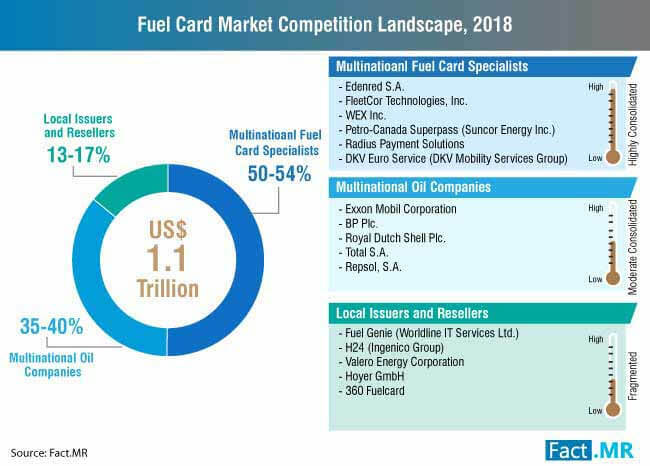 Leading players in the fuel card market profiled in the Fact.MR report include Fuel Genie (Worldline IT Services Ltd.), H24 (Ingenico Group), Valero Energy Corporation, Eurowag (W.A.G. payment solutions, a.s.), Hoyer GmbH, 360Fuelcard, Exxon Mobil Corporation, BP Plc., Royal Dutch Shell Plc., Total S.A., Marathon Petroleum Corporation, Repsol, S.A., Petro-Canada Superpass (Suncor Energy Inc.), Voyager Fleet Card, Radius Payment Solutions, and DKV Euro Service (DKV Mobility Services Group). Note: To gain more information on the competitive landscape in the cheese shreds market, get the summary of this report. Leading players in the fuel card market are working towards establishing a strong network of payment software developers, fuel companies, as well as financial institutions to meet the increasing demand for fuel credit cards. Though universal fuel cards are among the most popular types of fuel cards, fuel credit cards are rapidly becoming conventional among end-users, especially across commercial fleet. To capitalize on the rapidly increasing demand for fuel credit cards, a mounting number of world’s leading financial service companies are entering the fuel card market. As commercial fleet has expanded rapidly with growing urbanization and industrialization, commercial fleet remains the primary target for market players. 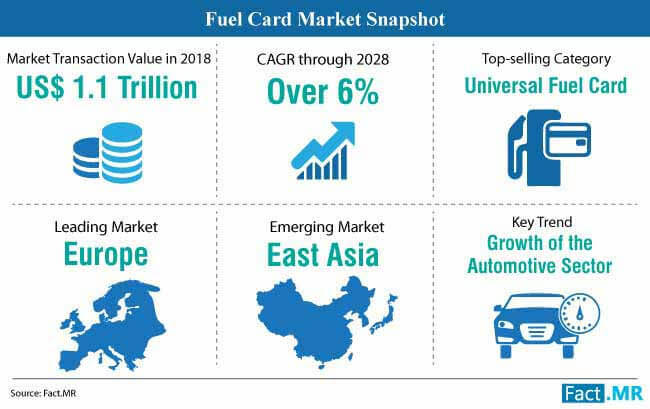 A recent study published by Fact.MR analyzes growth of the global fuel card market to provide readers with exclusive and actionable market insights. This study is backed by a two-step research process which is inclusive of various primary and secondary resources. The primary research methodology includes discussions with experts of fuel card industry and information gathered after interviewing other stakeholders. 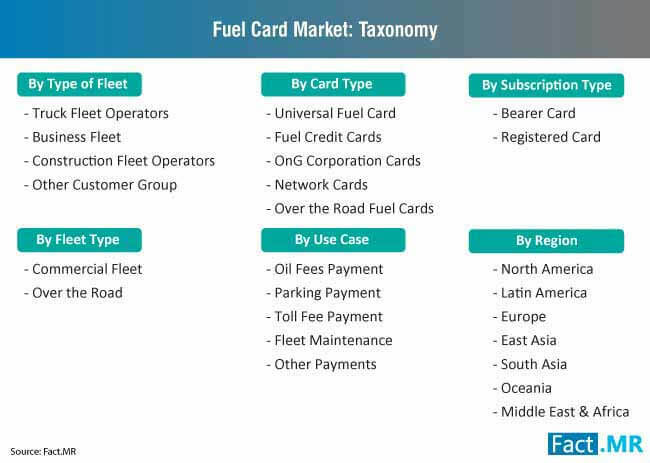 In the secondary process, detailed information about the fuel card market is garnered through various resources such as company annual reports, trade journals, paid resources, press releases, and other publications relevant to fuel card. After studying industry-validated information about the fuel card market, qualitative conclusions about the prospects of the market can be reached. Findings from these two main processes were used to determine an accurate and exhaustive forecast of global fuel card market for the period from 2018 to 2028. 15.12. Royal Dutch Shell Plc.